Once you’ve purchased a S&W M&P Shield 40 handgun, you’re probably going to be in the market for a holster to go with it. This might seem like a simple decision until you realize that there are dozens of different M&P 40 holsters on the market. And you’ll need to decide if you intend to open carry or conceal carry your weapon, and how accessible you’ll want it in an emergency situation. After looking at a number of different holsters and rating a variety of factors, I’ve decided that the Concealment Express KYDEX IWB Gun Holster has the best combination of quality construction, concealability, positive retention, light weight and is comfortable to wear even for everyday carry. 1 What are the Best Holster Options for an M&P 40? What are the Best Holster Options for an M&P 40? Once again, much of this depends on how you intend to use and carry our firearm. If you want a holster mainly for the range you might make a very different choice than if you want one to conceal carry or carry at your ankle. Comfort is usually another top concern, especially if you want to wear your firearm on a daily basis. Another factor is whether or not you spend your days driving, or sitting at a desk, or outdoors and on your feet. Your dominant shooting hand also comes into play when choosing a holster. Many holsters are designed for a dominant hand (usually the right) while others are ambidextrous. Some shooters also prefer to cross-draw from their non-dominant side, so this is another consideration when selecting a holster for your M&P 40. While there are a range of different M&P 40 holster makes and models on the market, for this article I’ve narrowed it down to the following types: IWB, OWB, belly band, ankle, and pocket holsters. Though they’re not as easily concealed as IWB holsters, the inside-the-waistband holsters are still a popular choice for gun owners, including military and law enforcement personnel. These holsters typically clip onto the belt, or attach via a pair of belt loops (some holsters have both). Most shooters wear these holsters close to the body and behind the hip. Many of the newer OWB holsters are thin enough that they can be concealed quite easily beneath a suit jacket or loose shirt. Another popular choice is the inside-the-waistband or IWB holster. As the name implies, these holsters are worn inside the waistband of your pants or jeans, and clip or slid onto your belt. These holsters can be worn at the small of the back, the hip, or the appendix position, depending on what’s most comfortable. Most of the newer IWB holsters are made from polymer plastic, although some leather models are available. Since leather is more flexible than plastic, these holsters are sometimes more comfortable to wear for long periods of time. Some shooters just aren’t comfortable wearing their firearm at their waist, and so a belly band holster can be a good option, especially if you conceal carry. These holsters are made from a wide elastic band, and are worn tightly around the torso (usually concealed beneath a shirt). This can be a more comfortable carry, especially if you’re a driver or you spend a lot of time sitting down. But accessibility can be an issue, as the gun is typically hidden beneath your shirt. And some people find they perspire beneath a belly band holster, so keep this in mind if you live in a warm climate, or you’ll be carrying a lot outside during the hot summer months. While not as popular as the IWB and OWB holsters, there are some shooters who prefer to carry their firearm in an ankle holster. These are popular with detectives and off-duty police officers, and shooters who want a holster for a backup or secondary weapon. Like other holster types, some gun owners find ankle holsters comfortable to wear, while others do not. You’re also limited to a fairly small firearm with an ankle holster. These do make good conceal carry holsters, as long as you wear pant that are long enough to prevent your gun from being visible when you’re sitting down. Another popular choice for concealed carry is the pocket holster. As you can imagine, this type of holster fits into your front or back pocket, and is designed to keep your weapon in the proper position for drawing while at the same time protecting it from dirt and wear. Just be aware that drawing from a pocket holster takes some practice, as you don’t want the holster coming out with your gun. Like the ankle holsters, a pocket holster works best with a relatively small firearm. All right, now let’s take a look at several different holsters that are made to fit the M&P 40. All of these holsters are made by reputable companies, and have been well-reviewed by many satisfied customers. 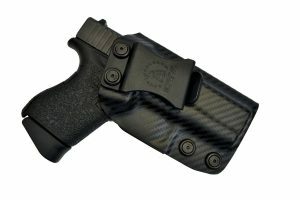 This is an outside-the-waistband paddle-type holster that has a unique carbon-fiber finish. The holster comes with both a belt loop and a paddle platform for added versatility. This is a level 2 retention holster, so you won’t have to worry about losing your weapon at an inopportune time. The Serpa uses a patented auto lock release that offers level 2 retention, and the there is an audible click upon re-holstering your firearm for added security. The holster keeps your M&P 40 at the proper position all the time, allowing for a smooth and correct drawing motion. The speed-cut design affords a rapid draw and target acquisition, and even allows the shooter to re-holster while keeping his or her eyes on the target. The main negative with this holster is that it can be hard to conceal at times. If you wear the holster high on your hip, your gun can protrude beneath your clothing. This inside the waistband Kydex holster by Concealment Express is made from Kydex polymer. The holster is lightweight and thin, and makes a great choice for concealed carry covered with an un-tucked shirt. It is comfortable to wear even after hours of use, and is made in the USA. This holster is made from .08” Kydex, and it’s extremely lightweight at only 2.5 ounces, making it only slightly larger than your handgun itself. 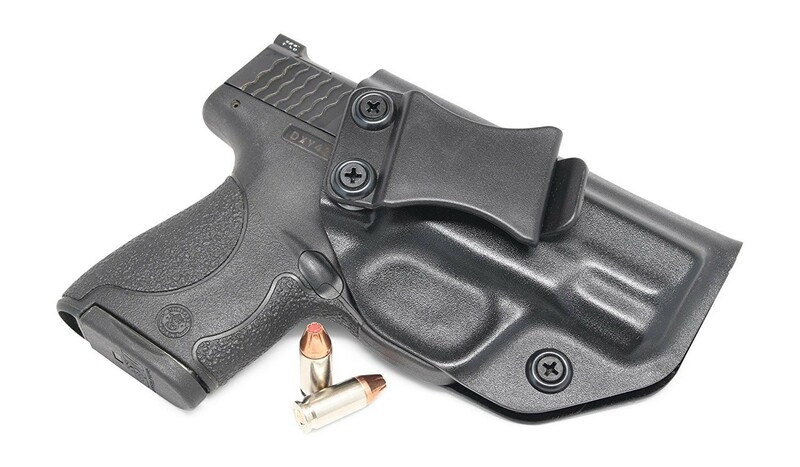 This IWB holster has adjustable retention pressure so you can adapt it to your gun. The carry angle is also adjustable from 0-15 degrees, so you can adjust it to your liking. This also allows the holster to be worn at almost any position, including hip, appendix, and back carry. Concealment Express uses a “Posi-Click” retention system and gives an audible click when your gun is locked into position. You won’t have to wonder if your weapon is going to fall out at the wrong time. These CE holsters have a full sweat shield that’s designed to keep your weapon dry, and it also serves as a guide when re-holstering. The trigger is also fully covered for added safety. The belt clip on this holster is not adjustable, and it’s rather large. You’ll want to wear a 1.5” belt in order to keep the holster stable and in place. Since the holster is hard Kydex polymer, it can rub against your skin and become uncomfortable with extended use. One remedy is to wear an undershirt to keep the holster away from your skin. 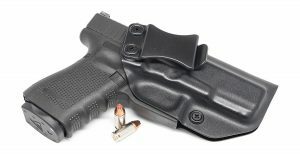 This is another popular IWB holster from CYA Supply Co. CYA makes their holsters out of Boltaron, which the company claims is a better material than Kydex. This polymer is extremely durable and heat resistant, and will keep its shape for many years of everyday use. As mentioned above, this holster is made from Boltaron thermoplastic. This material is extremely rugged, and it has high temperature and impact resistance. This IWB holster has an adjustable cant (with a provided hex key) from 0-15 degrees, allowing it to be worn in every position from appendix carry to small of the back. The retention is adjustable to your liking via a pair of adjustment screws. CYA Supply Co. designed this holster with reliefs for the safety and slide release, reducing friction for less wear and a better draw and re-holster. As with other hard plastic holsters, the CYA Supply Co. can rub and irritate your skin after long hours of use. An undershirt usually takes care of the problem, but this could be an issue in the summer or if you live in a hot climate. Because this holster doesn’t cover the rear sights of your gun, your weapon can dig into your side when you’re sitting down. Changing the position of your holster usually mitigates this. As I mentioned at the top of this article, my choice for the best holster in this group is the Concealment Express IWB holster. It has the best combination of price, quality construction, small size and weight, concealability, and it’s made in the USA.